What Percentage of Income is Income Tax? If you have taxable income, the amount of tax you will pay on that income depends on how much you make and the type of income you have. Wages are taxed at different rates from other income sources, such as dividends or interest, and Form 1099 contractor employees who don't have taxes deducted from their paychecks must also pay the taxes normally fronted by an employer. Even if your only source of income is wages from a regular job, the amount of tax you pay depends on how much you make. Generally speaking, the percentage of your income devoted to income tax is determined by the specific income bracket you find yourself in. Wages are taxed based on your income level and whether you file your taxes as single or married. These levels are called tax brackets. The brackets are cumulative, which means that your total income is taxed at different levels. 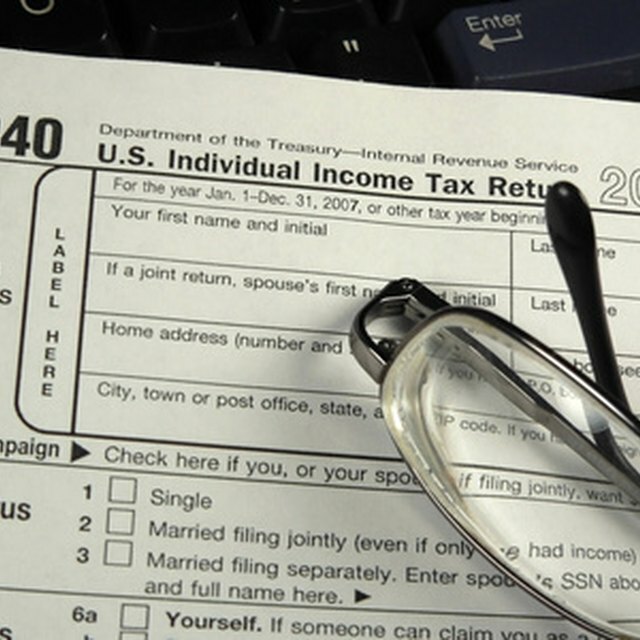 Your federal income tax rate is also determined by whether you're single or married. The Tax Cuts and Jobs Act of 2017 (TCJA) was signed into law in December 2017, altering the long-standing tax brackets for individuals; however, that law is only applicable starting with the 2018 tax year, and those returns are not filed until 2019. In addition to income tax, you must also pay FICA taxes, which are your Social Security and Medicare taxes. These are not taxed in brackets. For both the 2017 and 2018 tax years, the Social Security tax rate is 12.4 percent, and the Medicare tax rate is 2.9 percent. However, individuals who are W-2 employees are responsible for only half of that; employers must pay the rest. Therefore, 6.2 percent of your wages will go toward Social Security, and 1.45 percent will go toward Medicare. Your employer is then responsible for paying 6.2 percent to Social Security and 1.45 percent to Medicare on your behalf. In 2017 and 2018, individuals who make $128,400 per year or more will pay Social Security taxes only up to that amount. Any income over that amount will not be subject to Social Security tax. Individuals who make more than $200,000 per year (or married couples filing jointly who make over $250,000 per year) are subject to an additional Medicare tax of 0.9 percent on the amounts above these thresholds. These add up to a total of $18,289.50 in federal income taxes. These add up to a total of $20,981.75 in federal income taxes. Contractors who receive a 1099 form from their employers rather than a W-2 must also pay self-employment tax. Self-employment taxes consist of Social Security and Medicare taxes. As described above, these taxes are split between the employer and the employee in a regular employment situation. However, if you receive a 1099 and your employer deducts no taxes from your pay, you are responsible for the entire 12.4 percent toward Social Security and 2.9 percent toward Medicare in addition to your income taxes. Most states and some municipalities also levy their own income tax in addition to federal income tax. The tax brackets here apply only to federal taxes.